Gampopa Sonam Rinchen was born in 1079 in the Nyel valley in Central Tibet. At the age of seven he began studying medicine and at sixteen he got married. Practising as a doctor, he eventually became a renowned physician, which earned him the name Dakpo Lhaje, ‘the physician from Dakpo’. He lived happily as a householder with his wife, children and the respect of his community until, at the age of twenty-five, his wife and children died during an epidemic. Distraught, he renounced the householder’s life and turned his mind towards the dharma. At the age of twenty-six, Gampopa received full monastic ordination in the Kadam order of Atisha, and remained studying and practising in this tradition for a number of years. This training would have special significance both for the way in which Gampopa himself would one day transmit the teachings, and for the future Kagyu lineage as a whole. Milarepa then gave Gampopa instructions and sent him off to meditate in a nearby cave. After just over a year, during which Gampopa reported ever-advancing signs of attainment, Milarepa gave him the transmission of his entire teachings, including Tummo and Mahamudra. After Gampopa had shown excellent signs of progress, Milarepa said it was time for his disciple to leave and to undertake twelve years of retreat in his homeland. After predicting that Gampopa would become a renowned master, Milarepa said he had one last piece of crucial advice. Hoisting up his robe, he showed Gampopa the hard calluses on his buttocks: the sign of his years of solitary practice and tireless diligence in the pursuit of enlightenment. In accordance with his guru’s advice, Gampopa spent twelve years meditating in different retreats, bringing to fruition what Milarepa had taught. After this he decided to return to Milarepa. 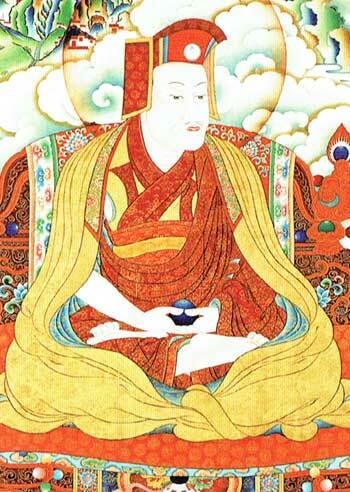 However, while passing though Yarlung on the way, he learned that Milarepa had passed away. Grieving, he returned to retreat and continued with his meditation, eventually moving on to the Gampo region (from where the name Gampopa is derived). By this point by a number of students began to gather around him. These grew in number, eventually fulfilling a prophecy that Gampopa’s activity would be vast, bringing incalculable benefit. Four of his disciples went on to establish four subdivisions of the Kagyu tradition: Dusum Khyenpa, who became the First Gyalwa Karmapa and established the Karma Kagyu; Pakmodrupa Dorje Gyalpo, who established the Pakdru Kagyu; Barompa Darma Wangchuk, who established the Barom Kagyu; and Zhang Yudrakpa, who established the Tsalpa Kagyu. These four lineages, along with those that would stem from them, are collectively termed the Dakpo Kagyu. With the founding of his monastery, Daklha Gampo, Gampopa initiated the monastic order of the Kagyu and formally established the transmission of the Kagyu path. Combining the Kadam Lamrim, monastic and scholastic traditions with the Mahamudra and tantric practices he received from Milarepa, he was able to provide for a range of spiritual practitioners. Through Gampopa’s compassionate vision, the Kagyu tradition has become rich in methods for leading disciples to realisation.